May the 4th be with you! For some Star Wars geeks, there is a certain fascination about owning things related to the epic saga that is Star Wars — whether it be a display or an item for day-to-day use. But some geeks have gone far beyond buying items to creating their own. Some people even found some good kind of fun in creating their own Star Wars themed cake for themselves, for a friend or a family member. Some even tried to sell with a celebrator-requested design. Today is May the 4th 2017, a.k.s Star Wars Day and these 16 amazing Star Wars cake creations are absolutely the best way to celebrate this awesome day! Can a cake get any more detailed than this – a cake designed to look like a Death Star. Perfect for a Star Wars geek, this cake has very intricate details, displaying tons of panels with conduits and LED lights to copy the Death Star! So beautiful, it would be heartbreaking to cut this cake into pieces! A perfect match to a Death Star cake, is this cake that’s sculpted to Darth Vader’s head. You can’t just deny that it’s well made, too. If you plan on making something like this, just remind your guests that this one’s for their tummies and not for their heads. The cakes from the dark side continue with this Stormtrooper cake, showing, well, no less than a standing Stormtrooper that’s ready for battle. And here are more Stormtroopers to join the battle. These are cupcakes topped with a huge marshmallow to look like Stormtrooper heads, plus more cupcakes joined together to form lightsabers. It’s just too cute, I think! Not into the dark side? Then, this cake’s for you. One creative and talented baker tries to make a neat miniature of the Millennial Falcon. Do you want this to land in your kitchen, too? I do! Joining the Imperial army’s battle is the Star Destroyer. That also looks like a really big slice of cake. 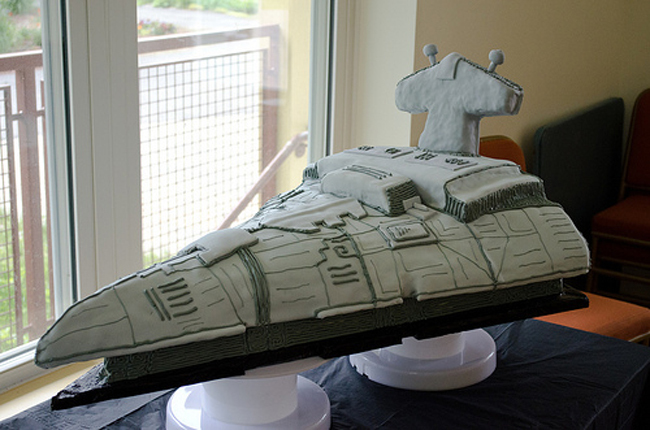 I already thought that the idea of making a cake that looked like the warships in Star Wars is insane. But someone has taken the Star Wars challenge and proved to be something. This cake showed no signs that it’s a cake and looks more like a miniature AT-AT walker display! 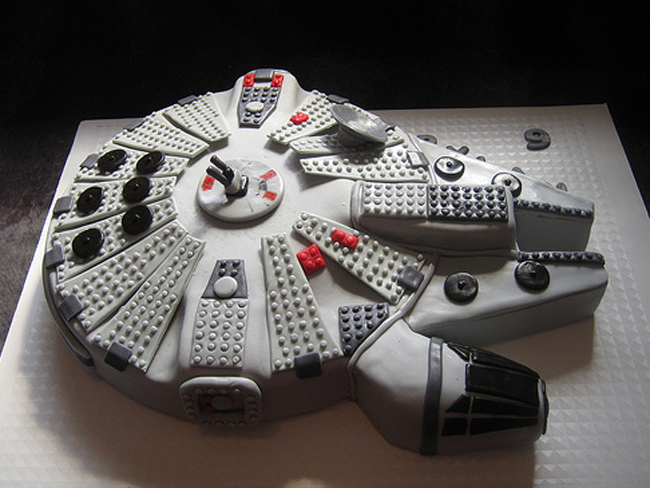 But it is a cake that has gotten acclaims from Star Wars geeks and renowned bakers alike. I wonder how they sliced the cake though. Here’s one that looks more like a cake but in a fascinating way. Why? See, the layers are beautifully etched with Star Wars characters and there’s even a Death Star as a bonus on top! We all love Star Wars robots, right? Who doesn’t love R2-D2? For all of us who were entertained by this robot, here’s an R2-D2 cake that’s almost close to a life-size figure. Just don’t expect it to move around and fix your technical glitches. Or do you want to get a BB-8 Droid design for a cake perhaps? Our dear master Jedi Yoda is ready for battle against the dark force. This is what this cake suggests. And look at the cake’s color that gives the galaxy feel. The makes of this cake did not just try it, he nailed it, I think. In a similar looking cake, how about Yoda with the Millennium Falcon? Also a good idea, right? Here’s another take at galaxy X Star Wars feels: a three-tiered cake that just displays perfect-looking Star Wars characters, it almost looks like a photograph of them. As a bonus, there are glowing lightsabers protruding out of the cake! Obi-Wan, Luke Skywalker, Princess Leia, Han Solo with Chewbacca have come together to fight the dark force. So this cake shows. If you plan to make your own Star Wars-themed cake and lack the creative prowess to sculpt the characters into the cake itself, you can also use inedible Star wars figurines to top your cake! Having the LEGO miniatures is another option. Or make edible versions that look exactly like the LEGO ones, just like the maker of this cake did! This one’s for the little girls that love Star Wars: a pastel pink tiered cake that has fondant designs of the Star Wars characters. I personally think that the way the characters were made to look like little boys and girls is cute!